Keep your hands warm and cozy with these beautiful thrum mittens (or Thrummed Mittens as some say) made with Peace Fleece wool in your choice of 42 wonderful colours. Our kits contain everything you need to knit a pair of these for yourself or a couple of pairs for a child or toddler. We also sell the thrum material separately for other projects. Technically "Thrums" are waste fibre from the Weaving or Knitting process. However, our thrums are pure 100% carded wool fleece that knitters can break into small thrums to knit into a garment like a set of thrum mittens. 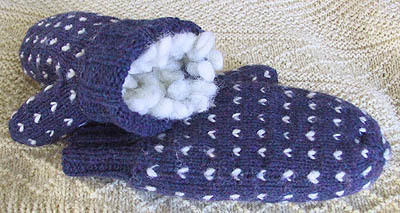 Thrum mittens are produced in a similar fashion as conventional mittens, but with the ends of small pieces of raw wool or "thrums" knit into the design. 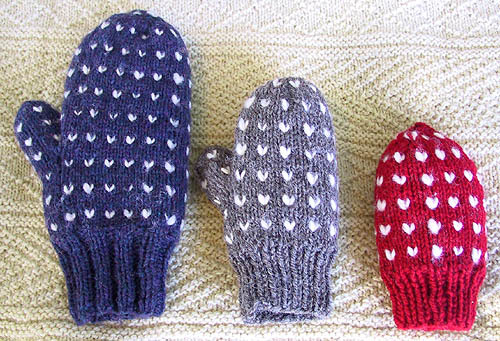 A small bit of each of the wool thrums are visible on the outside of the mitten and appear as tiny white "hearts". 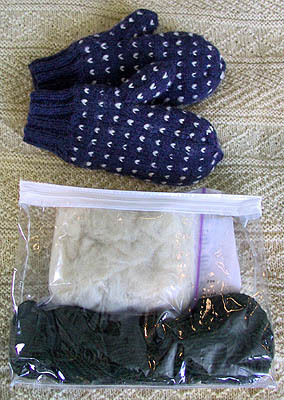 The secret to thrum mittens is that the majority of the wool thrum, like an Iceberg, is hidden inside the mitten. Upon putting them on, the wearer experiences the ultimate in luxury as their hands are completely enveloped in the wonderfully soft wool thrums inside! Each Thrum Mitten kit comes complete with 1 skein of 2-ply Peace Fleece yarn in your choice of colour. 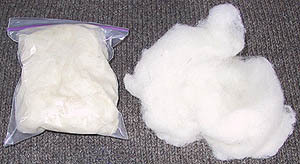 Also included is a 2 ounce (56 gram) package of raw wool fleece to make the thrums. These are packaged in a handy zippered plastic bag along with a full set of instructions for knitting the thrum mittens in three different sizes. We have also put together another kit that includes the set of 4.0 mm (US Size 6) Double Pointed needles you will need for this project. Each Thrum Mitten kit contains enough material and the instructions to make an adult pair of mittens or two pairs of children or toddlers sized mittens. All three sizes are shown, using the colours Violet Vyehchyeerom, Father's Grey and Ukrainian Red, in the picture at the top. Note that the toddlers size do not have thumbs. There is enough yarn in the kit to attach the mittens together to ensure your child will not lose them.